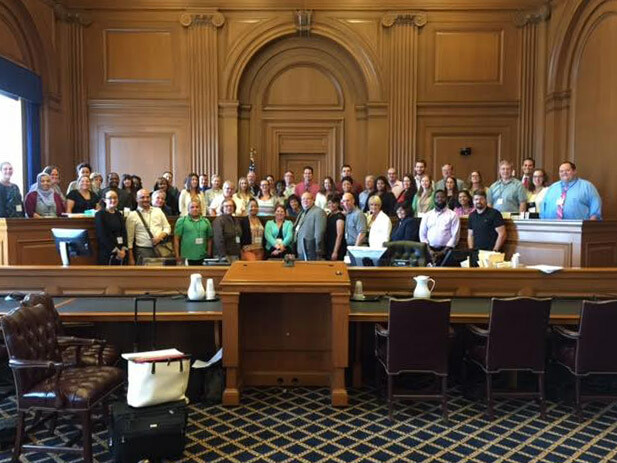 July 8, 2016 – Middle and High school teachers from NYC and Albany attended a five day professional development summer institute at the Thurgood Marshall Courthouse. As part of a US Dept. of Ed’s James Madison Legacy grant, teachers participated in outstanding sessions facilitated by scholars ( federal judges and law professors) based on the civic education materials, “We The People: The Citizen & The Constitution.” Teachers were assigned expert “We The People” Mentors to assist with implementation of a mock court hearing. Federal judges and law professors presented topics on the Bill of Rights and the Constitution. The judges included: Honorable Reena Raggi & Gerad E. Lynch of the U.S. Court of Appeals for the Second Circuit, Judge Lewis A. Kaplan of the U.S. District Court for the Southern District of N.Y , Judge Paul Oetken, U.S. District Court for the Southern District of N.Y. , Judge Joseph Bianco of the U.S. District for the Southern District of N.Y. and Magistrate Judge James Francis IV. The law Professors included: Chris Riano of Columbia University, Jeffrey Morris of Touro Law School, Steve Gilles & Martin Margulies of Quinnipiac Law School ,Myriam Gilles & Julie C. Suk of Cardozo Law School , Aaron Saiger & Benjamin Zipursky of Fordham Law School and Emily Gold Waldman of Pace Law School . Judges D’Agostino, Moses, Peck, Trust, Maas and Stewart presided over a mock court hearing on the final day. All of this was made possible by Chief Judge Robert Katzmann. James Madison Legacy Summer PD Opportunity! Tuesday, April 19, 2016 – Attention NYC High School and Middle School Social Studies Teachers! The Justice Resource Center is offering a summer Professional Development opportunity at the Thurgood Marshall Courthouse as part of the We The People James Madison Legacy Project. November 6, 2015 – On Election Day, Nov. 3, the Justice Resource Center (JRC) hosted 15 teachers for a Professional Development day on bringing civic education programs to their classrooms. Teachers role played attorneys and Justices in a Supreme Court First Amendment case, argued the rights of student speech, and presented on public policy issues in the community. The PD session focused on The Constitution Works and Project Citizen, two programs that engage students in learning about the Constitution, preparing and presenting arguments, and taking an active role in civics. September 17, 2015 – Happy Constitution Day! In honor of the great document, the JRC would like to share these opportunities for enriching your classroom and engaging students in understanding the Constitution.